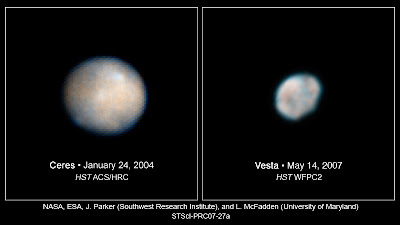 There are photographs of asteroids Ceres (left) and Vesta (right), two of the most popular asteriods and much viewed by amateur astronomers in the solar system apart from Eros. The Hubble Space Telescope (HST) has taken their photographs to help prepare for the coming mission of the Dawn spacecraft, which will be the first satellite to tour a dwarf planet. To see a movie clip of Vesta rotating, click here.